If you missed it, check out this link to a great Marketwatch story about the NFL mom making sure her Chicago Bear-playing son stays on the financial straight-and-narrow. She watches all his games and filled in for him at the Personal Finance boot camp held here in Fort Lauderdale for NFL players. I made this must reading for my 21-year old son. (There was a lot of eye-rolling when he hit the “mama’s boy” quote, but every mom is guaranteed to find that part absolutely adorable!). 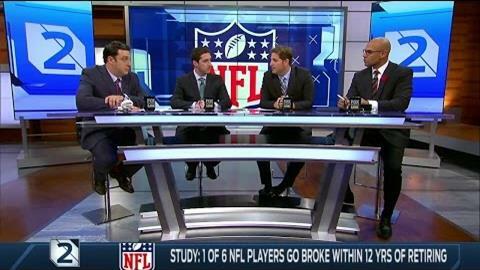 You may already know the stats (“Why NFL Athletes Go Bankrupt And What You Can Learn From Them“). Believe it or not, professional athletes aren’t that different from the rest of us. They may make a lot, but if they can’t control their expenses, and don’t make a concerted effort to save and invest (and ignore the brother-in-law’s advice), they’ll end up with nothing. The same holds true for all of us. Take a look at our 3 top money tips for athletes – or just ordinary Joes and Jills like the rest of us. And don’t miss the Marketwatch interview with NFL mom Armelia Rolle. She says financial advisors need to deliver the truth to their clients and take them to task when they’re overspending. Most don’t, she says, for fear of losing the client. She talks about raising her son through the “school of hard knocks,” the challenges of first-generation wealth, how she keeps it real, and what she does to protect her son. It’s an inspiring piece, and a must-read for anyone struggling to protect what they’ve earned.